Eltz castle (Burg Eltz in German) is an authentic medieval castle that survived the centuries. Its unique setting on an oval rock in the Elzbach valley, surrounded by woodlands and the little stream (on three sides), gives the castle a fairytale and magic appearance. Due to its location, the castle could not be expanded horizontally. The rock builds the foundation, that's why it grew only in height. Over the centuries, the Burg as we can see it today, developed. Several towers, turrets, spires and bay windows were added by the family members and make up the unique picture of Eltz castle. Can a location be more romantic than this? When you walk down from the car park along the shuttle bus route, you'll get this stunning view! Unlike many castles in Germany, Burg Eltz has never been destroyed, although it was built on a then important trade route. Visitors can still admire 850 years of medieval history. 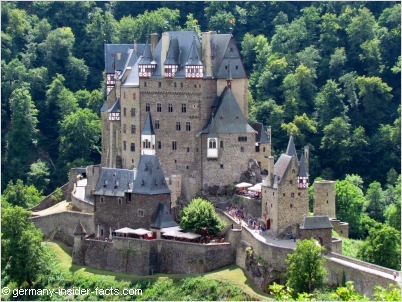 The castle has been owned by the same family ever since the name "Eltz" was first mentioned in 1157. It is considered a real German treasure, that's why it was featured on a 500-DM note from 1961 to 1995. Let me introduce you to one of my favourite castles in Germany. Indeed, it was one of the first I ever visited with my husband more than 40 years ago. And of course, we came back! Find all the information you need to plan and enjoy your visit at this stunning example of a German medieval castle. I am always fascinated by the history of old castles, that's why I want to give you at least a quick overview. 1157 - Rudolf von Eltz signed a donation deed, issued by Emperor Friedrich Barbarossa, as a witness. It was the first time the name was mentioned in a document. At this time a small castle existed on the Elzbach. The Romanesque keep Platt-Eltz still can be seen today. A part of the old pallas is integrated into the Kempenich Houses. 1268 - After a disput, the brothers Elias, Wilhelm and Theoderich split the castle and the estate. Burg Eltz became a so-called Ganerbenburg. That means several family lines own the castle, and live together there. 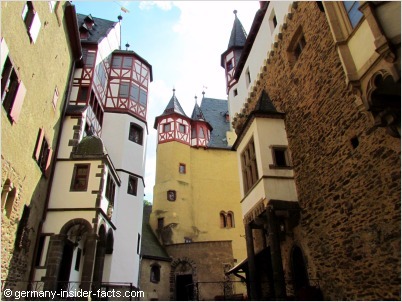 The three family lines Eltz-Kempenich (Eltz of the golden lion), Eltz-Rübenach (Eltz of the silver lion) and Eltz-Rodendorf (Eltz of the buffalo horns) built their own living houses and towers within the castle. Actually, building activity stretched over more than 500 years until the 17th century. From 1323, the "Eltzer Burgfriedensbriefe", contracts for a codex of rules, regulated the cohabition. The codex was amended a few times over the centuries. 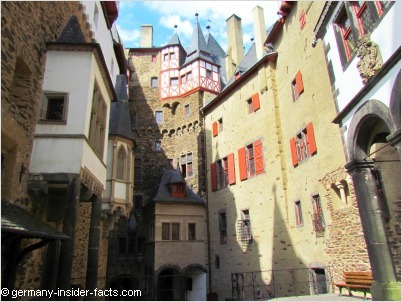 The "Eltz Feud" was a 5 years quarrel with Balduin, archbishop of Trier, in the 14th century. 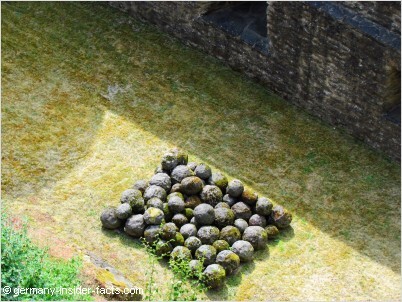 After a canon attack failed, Balduin built the castle Trutzeltz on a hill opposite Eltz castle to besiege and attack Burg Eltz with catapults and heavy stone balls. After 2 years, the Eltz families finally gave up when they run out of provisions. Although most of the outer fortification had to be demolished after the Eltz Feud defeat, the castle itself was never destroyed. Clever family tactics and wise diplomacy helped to avoid battles and attacks during disputs and wars in the following centuries. 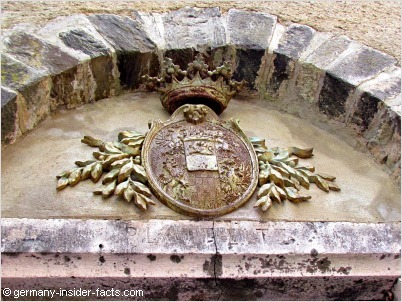 1786 - The Eltz-Rodendorf branch of the family ceased, their part of the castle was passed to the Kempenich family. In 1815 Count Hugo Philipp bought the Rübenach House, since then the Kempenich family has been the sole owner of Eltz castle. Dr. Karl Graf von und zu Eltz-Kempenich, alias Faust von Stromberg, is the present owner of the castle, in the 33st generation! 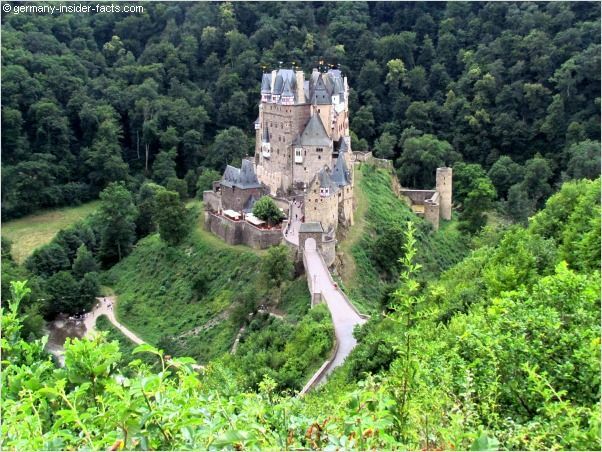 The secluded location and unspoiled nature in the surrounding forests add to the magical appearance of Burg Eltz. The major attraction, of course, is the fascinating architecture of the castle. Eight towers, up to 35 metres high, huddle together. 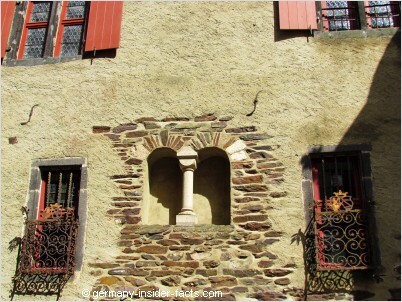 Solid stone walls, topped with timber frame structures, oriels and turrets - there was always a way to add another room. About a hundred rooms offered a home for up to hundred family members, numerous servants and guests. Many of the rooms could be heated, this was not common in the old castles. As there were no hotels in the former days, noble families were obliged to accommodate guests, of course only those who arrived with good intentions. Visits could last for up to one year and included also the entourage, so guests had to pay according to fixed tariffs. I think it is interesting that a prince had to pay more than a simple knight or servant. These tariffs were specified in the above mentioned "Burgfriedensbriefe", the money was used to build and maintain the castle. The building period of Burg Eltz lasted about 500 years, until the 17th century. Of course, it still needs a lot of money and effort to maintain such an ancient castle. The first extensive restoration works took place in the 19th century. Thankfully, the responsible Count Karl zu Eltz did not alter the castle, he used great care of the existing architecture, a fact that is still admired by experts today. From 2009 until 2012 was another extensive restoration period to secure that the castle won't fall apart. Structural repairs included the roofs and timber frame constructions and replacement of technical equipment. With fresh paint the castle looks "new" again. Comparing with photos from my first visit, I could really see the difference! Visitors can roam the inner court yard freely. You can also visit the two restaurants without paying an entrance fee. However, to see the rooms inside, you'll need to join a tour and pay for a ticket. A guided tour takes you to several rooms & halls and the armoury (Waffenkammer) within the Rübenach and Rodendorf houses, most of them still have their original furniture. Discover wonderful artworks, murals, weapons and hunting trophies, and much more. See how noble families lived centuries ago. The original 15th century Rodendorf Kitchen is a favourite amongst visitors. See the Knights Hall which was the meeting place for members of the three family lines. Festivities and important negotiations were held in this spot. Interestingly, the walls in the hall are decorated with jesters’ heads. Did you know that in the Middle Ages jesters could speak freely without fearing consequences? They had "Narrenfreiheit" (jester's licence), a word that is still common in Germany these days. Another decorative feature in the knights hall with a deep meaning is the "rose of silence". It means that no spoken word should ever leave this room. 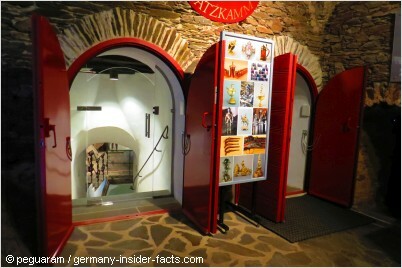 Entrance to the treasury (Schatzkammer) is available with a tour ticket, but not included in the tour. Visitors can explore the treasury on their own. The private collections offer artworks by German gold and silver smiths, jewellery, precious porcelain and glass, weapons and other fascinating exhibits collected over 500 years. Exhibits are labelled in German, however, a free brochure with English translation is available. Getting thirsty, or hungry? There are two self-service restaurants, the upper and lower Burgschänke, which serve typical German foods and cakes. Both restaurants have seats inside and outside. We enjoyed a Bratwurst & potato salad lunch on a hot day at the lower Burgschänke. There is a nice view to the Elzbach valley, it was fun to watch kids and dogs playing in the shallow stream. How to get to Eltz Castle? Because of its seclude location, most possibilites to reach the castle involve some hiking, especially when you use public transport. Most visitors enjoy the hikes through the forests as a special experience. This is the easiest way to reach the castle. From Koblenz along the Mosel valley use the B416 until you reach Hatzenport. Turn right onto the L113 to Münstermaifeld. Before you reach the town centre, turn left to Wierschem. You can also use the Autobahn A49 from Koblenz, turn off at exit 7 (Polch), follow the L113 to Münstermaifeld and turn right to Wierschem at the end of the town. From Trier take the Autobahn A1 and A48, turn off at exit 5 (Kaifenheim) and follow the road through Roes and Pillig to Wierschem. From Cochem use the B49 and B416 to Moselkern, turn left to Münstermaifeld and then to Wierschem. From Wierschem follow the signs to Burg Eltz until you reach the huge parking lot in the woods. 1. Take the walking trail (1,3km) through the forest, which goes slightly downhill. When you leave the forest, be prepared for the jaw-dropping view of the castle. The trail is not suitable for prams, use th shuttle bus route instead. 2. 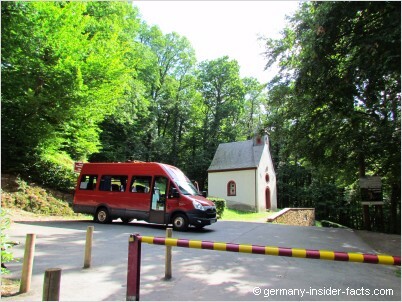 Walk the paved route of the shuttle bus which starts at the St Antonius chapel. It is slightly shorter (800m), but rather steep downhill. Just before the last bend, you get the stunning view of Burg Eltz. 3. If you don't want to walk at all, you can take the shuttle bus. It starts at the chapel at the end of the car park. You won't have to wait long for the bus. If you have a car, but want to hike partly and enjoy the nature in the Eltz forest, you can drive from Moselkern to the Hotel Ringelsteiner Mühle. From here you can walk along the Elzbach valley to the castle, about 2,4km (40min). At the end of the hike, you need to climb some steps to get up to the castle. There is a parking fee at the hotel if you are not a guest. There is a regional train (RB) that stops/departs at/from Moselkern every hour. You can check the DB website for connections. The Regionalbahn stops in many towns between Koblenz and Trier, so you can jump on the train whether you stay in Koblenz, Tries, Cochem, or in other towns. However, you can't buy tickets online, you get them from ticket machines at train stations. Hike from Moselkern train station - 4.8 km, about 70 to 90 minutes. You have to walk quite a bit through Moselkern at first, but there are enough signs that point you into the right direction. Once you reach the rail overpass, the route follows the valley of the Elzbach. You are still on a paved road until you come to the hotel Ringelsteiner Mühle. Behind the hotel the lovely trail through the forest begins. The route has light to medium ascents, but generally is considered an easy walk. The trail might be a bit slippery after rain, so wear decent walking shoes. We walked this route on your first visit in 1975. As I hardly can remember any details, it sure was not hard, otherwise I would remember! 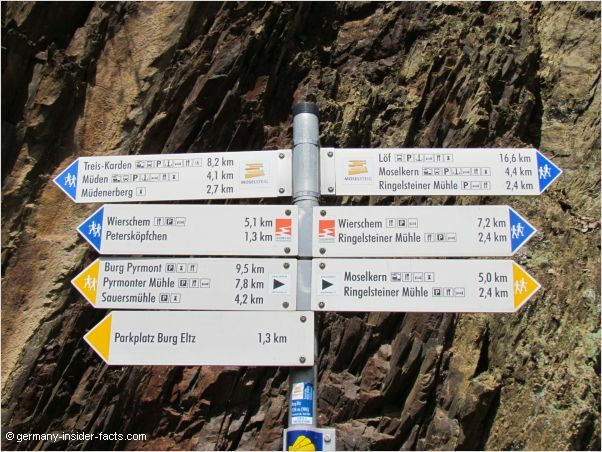 There are quite a few other walking trails from Müden or Treis-Karden. However, they are longer and more demanding. You can also walk from Münstermaifeld, or Wierschem, but that's just along the road. Now, did I made your mouth water to visit this unique castle, but you don't stay in the region at all? 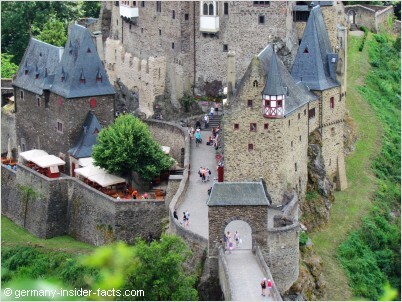 You can join a guided tour from Frankfurt to see Burg Eltz. The tour runs daily, from 1st April to 1st November. After you spend some time at the castle, you will have a dinner somewhere on the banks of the Rhine river on you way back to Frankfurt. Click here for more details & to book the tour. We visited the castle again on a hot weekday in July 2015. It was not as crowded as I expected, perhaps it was too hot. Eltz Castle is open daily from 1st April 2017 to 1st November 2017. Access to the souvenir shop, the restaurants and the inner courtyard is free, opening times from 9:30am to 6pm. Guided tours through the interior are available every 15 minutes from the courtyard. Tours in English, French and Dutch are offered as well, and alternate with German tours. Information sheets in other languages are available. Admission for guided tours and the Treasury are 10€ for adults, 6.50€ for children. There are discounts for families, children, students, groups (more than 20 adults). It is recommended that groups book in advance. While you wait for your tour, you can explore the Treasury on your own. Taking photos is not allowed in the castle rooms. Do avoid disappointment for visitors with walking disabilities, here is some info. 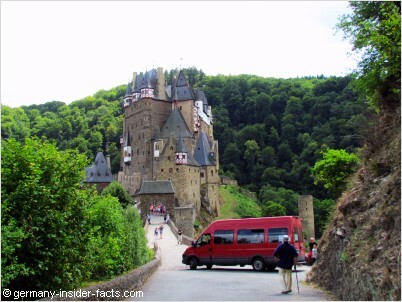 As Burg Eltz is an authentic medieval castle, it is not accessible for wheelchairs. Once you enter the Vorburg, there are a few stairs down to the lower Burgschänke, and more stairs to the up to the second restaurant and to get into the courtyard. But if you can manage a few stairs (they are secured with handrails), you can at least go and admire the stunning courtyard. On the guided tour you'll need to manage more stairs. Because my husband has problems with his knees, we didn't join a tour. For us, it was still worth to visit Eltz Castle, even without the interior tour. Please note: Bring some cash, as you won't be able to pay small amounts, like entrance fees, a drink, the shuttle bus etc with a credit card. Enjoy your stay at one of the best castles in Germany!